Breeding areas can provide incredible fall hunting. Canada has a vast and diverse array of wetlands that provide nesting, rearing and staging water for an incredible number of waterfowl species. 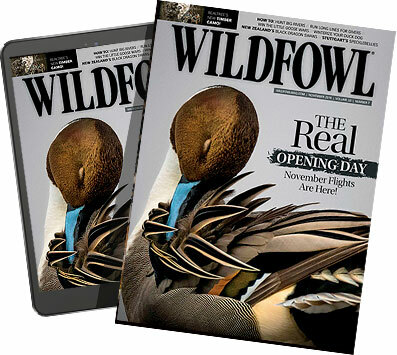 It's a virtual Cornucopia of adventure for traveling waterfowl hunters. Taking four species of geese in a single hunt is possible on the Canadian prairie. The northern territories are vast wilderness -- home to many species of ducks and geese. It is the production factory for the small Canada geese often referred to as cacklers, as well as snow geese, specklebellies and Ross's geese. All four flyways are fed by geese, dabblers, divers and sea ducks raised in this region that spans the width of North America. Unique opportunities exist along the coast of the Arctic Ocean from east to west. The Northwest Territories has incredible gunning along the large staging lakes. Hunters setting up on the Canadian Shield will feel like they're hunting sea ducks, but without the tides and salt water. Nunavut includes a vast number of islands that reach to the top of the world. Liberal limits and unique opportunities are available as early as Aug. 15. Eiders, scoters and oldsquaws nest and congregate before migrating. In the Yukon, birds concentrate and funnel through major river corridors and areas such as Nisutlin River Delta. Outfitters serve many areas of the north, but in some cases, hunting is set up through local hunter and trapper organizations. British Columbia is well known for its Rocky Mountains that were recently displayed to the world during the 2010 Winter Olympics. It might not come across as a waterfowl mecca, but the Pacific Flyway offers unique waterfowl hunting, including species such as brant and harlequin ducks. The coast sees large migrations of birds and the agricultural communities in the north-eastern portion of the province offer duck and goose hunting that rivals the rest of the Prairie Provinces. The lower mainland winters large numbers of dabblers, divers and geese. Late goose seasons extend into March, and ducks seasons run into January. Pacific brant are a highly sought species by waterfowl collectors. A 10-day brant season in early March features a two-bird limit with four in possession. The Canadian prairie is well known for incredible mallard and honker hunts. But the region has incredible waterfowl diversity, with a multitude of divers and dabblers. Manitoba is known for divers on historic waters like Delta Marsh, but the other two provinces offer great staging numbers of canvasbacks, redheads, goldeneyes and bluebills. Goose fanatics know the snow geese numbers are unbelievable. Alberta and Saskatchewan offer some of the best specklebelly and Ross's goose hunting on the continent. Canada goose populations are 500 percent to more than 2,000 percent over the long-term average, so the area has become a well-known destination for honkers. Specklebellies show up in late August, and hunting peaks in early October. Although mallards are the main draw, hunters can target an incredible diversity of dabblers that stage in good numbers in September and early October. Southern Alberta provides good late-season hunting, with seasons extending to late December. Saskatchewan, in the heart of the prairies and the parkland lakes, stages unbelievable numbers of all waterfowl. Manitoba has unique destinations such as the Whiteshell region for hunting bluebills, and Oak Hammock Marsh, which stages thousands of geese and ducks. Ontario stretches across central Canada, and is the northern border to most of the Great Lakes. Most of the province is Canadian Shield, with deep lakes better known for outstanding fishing. Southern Ontario has a well-established agricultural community, and the ducks and geese know where to take advantage of the feed. Hunting big water is popular, with a mixed bag of everything from teal to goldeneyes. Mallards, black ducks, ring-necked ducks and wood ducks account for much of the kill. The province provides outstanding Canada goose hunting. Waterfowl from the central and eastern Arctic migrate through Ontario, providing great diversity. Quebec borders the St. Lawrence Seaway, a hotspot for waterfowl. Most of this large province is made up of large lakes and rocky outcroppings across the Canadian Shield. The region is better known amongst caribou hunters, but birds hatched in this part of the world stage in southern Quebec, where they find the first agricultural fields to feed on high-protein crops. Lakes, marshes, rivers and bays on larger water bodies all provide opportunity. It doesn't matter whether you like teal, black ducks or snow geese, you'll be able to find them in Quebec. The Seaway attracts sea duck species such as oldsquaws, eiders and scoters. The Bay of Fundy, in Nova Scotia, is world renown for incredible tides that surge and pull from the Atlantic Ocean, but waterfowl enthusiasts recognize the region as one of the best sea duck destinations anywhere. The productive area draws staging birds and is a highlight just to visit. The Atlantic coast is also part of Newfoundland, New Brunswick and Prince Edward Island, which all offer sea duck seasons and liberal limits. Organized outfitters can help plan a successful hunt around historic migrations. Eastern Canadian provinces also offer good gunning for a number of smaller dabblers, as well as the popular mallard and American black duck. Merganser seasons are popular with locals and offer unique opportunities for hunters looking for something new. The potato fields of Prince Edward Island offer awesome Canada goose hunting -- further proof these birds are highly adaptable to a wide array of agricultural practices. Brad Fenson is a wildlife habitat specialist and freelance writer from Edmonton, Alberta.